Bison usually aren't bothered by fire – they just keep their distance. These young bison sense something different about the blaze and gallop away. A cumulonimbus cloud glows in the rays of an April sunset. A praying mantis waits in ambush on a stalk of big bluestem. Bobcats are common on the prairie but very seldom seen, let alone photographed. Two curious young bison decide to investigate Harvey's camera lens. One gets close enough to sniff it buck backs away when he finds nothing edible. Northern harriers are easily identified when hunting. The slim raptors fly and glide low to the ground, looking and listening for prey. This female locates a rodent in the grass and swoops to seize it. Tall tongues of flame leap into the air at the edge of an evening burn. Three white-tailed deer bound through the grass in a February snowstorm. In early autumn, the prairie glows with color. Green grasses become brown and gold, and wide swaths of sumac turn a firey, luminous red. In northeastern Oklahoma, hidden between plowed fields, pastures and oil rigs, the nearly 40,000-acre Joseph H. Williams Tallgrass Prairie Preserve is an ecological relic of the vast landscape that once swept down the center of North America. 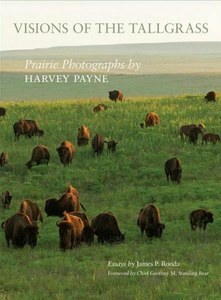 In Visions of the Tall Grass: Prairie Photographs by Harvey Payne, two old friends, photographer Harvey Payne and historian James Ronda, explore what’s left of the prairie they love together. University of Oklahoma Press, 2018.